1 Line a 24 cm (approximately 10-inch) diameter springform pan with plastic wrap. 2 Rinse salmon, pat dry, cut into long thin pieces horizontally and arrange in an overlapping fashion on the bottom of the springform pan. 3 With wet hands, place half of the rice into pan and press firmly. 4 Spread half of the wasabi paste onto the rice. 5 Use kitchen shears to cut nori sheets to fit pan and place cut sheets over the rice. 6 Add remaining rice to mold and press firmly. Cover with plastic wrap and refrigerate for about 1 hour. 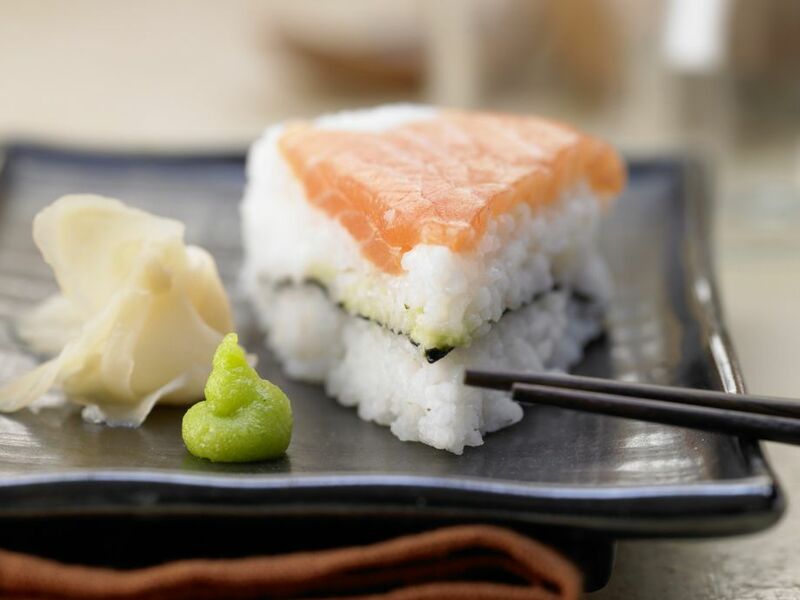 Unlatch the springform pan and flip the sushi cake onto a plate. Cut into pieces and serve with pickled ginger, remaining wasabi paste and soy sauce for dipping.